BLAEU - Mappa Aestivarum Insularum alias Barmudas. BLAEU, W. - Mappa Aestivarum Insularum alias Barmudas. Mappa Aestivarum Insularum alias Barmudas. - BLAEU, W.
Title : Mappa Aestivarum Insularum alias Barmudas.. Size : 15.7 x 20.6 inches. / 40.0 x 52.3 cm. Description :Blaeu based his work on John Speed's remarkably accurate map of 1626-1627. 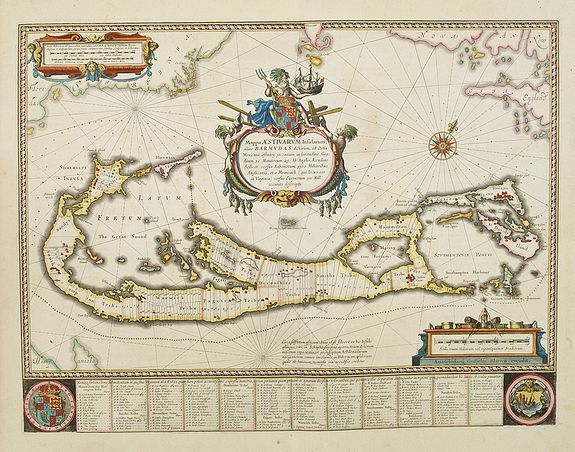 It shows the island divided into tribes and lots, and below the map itself appear the names of the first proprietors and the number of shares assigned each. A splendid cartouche shows Neptune astride the Royal Arms holding a ship. The miniature map below the cartouche shows the correct proportion of the island to the coast of the mainland. Further adorned with scale cartouches, coats of arms and compass rose with a fleur-de-lys. The map is superimposed over a map of the Atlantic with the coastlines of Britain, North America and Hispaniola showing the location of Bermuda. The 'Sea Venture' under Sir George Somers was wrecked off Bermuda in 1609 and the surviving Englishmen divided the island into Tribes (later Parishes) and Shares, which are individually listed with their owners at the foot of the map. Shortly afterwards the Bermudas were granted to the Virginia Company, hence various references to the Company on the map including the distance to the Roanoke Colony in Virginia. Condition : Paper slightly age toned and spotted. Generally very good. A good and dark impression.